Whether you're wrenching on a flying Spitfire or a leaking Spitfire, Haynes has a shop manual for you. Very useful, but hardly the sort of thing you'd keep on your coffee table. Well, you might keep shop manuals on your coffee table, but that would make you the kind of scarily focused gearhead who also keeps a couple of engine blocks in the kitchen. Not that there's anything wrong with that, of course, but Haynes also puts out this… this four-pound slab of concentrated essence of car pr0n, and- now that you're aware of its existence- your life without it will seem as grim and flavorless as the sawdust-enhanced sausage ration in Vladivostok, 1949. It sure as hell isn't cheap, so those of you with a birthday coming up are advised to start dropping some very strong gift-idea hints to your loved ones right now. The rest of you will have to cough up the rubles on your own, but it will be worth it. From the Ford clones of the 1920s and 1930s (starting with a copy of the Model A and continuing with the modified-for-Soviet-conditions Model B-based M1 shown above), the USSR was making cars and trucks from its earliest days. While some were based on foreign designs (the Opel Kadett-based early Moskvich and Fiat-based Lada being a couple of famous examples), many were all-Soviet projects. 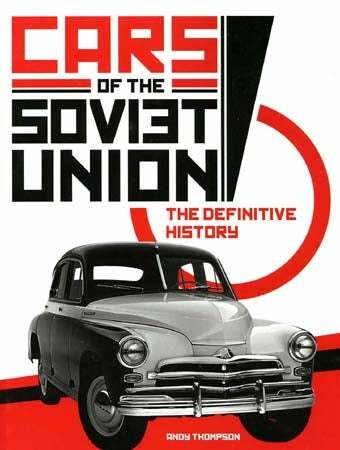 Thompson's book covers all the major lines of Soviet cars and light trucks, including the GAZ Pobedas and Volgas, the ZIL limousines, the beloved Zaporozhets, and a bunch of acronymic vehicles we decadent Westerners have never heard of. Vehicles manufactured according to the demands of a planned economy (in a nation whose rough roads cover 11 time zones and every crazy weather condition imaginable) were designed with different priorities than those found in the capitalist automotive world, and this book does an excellent job describing how those priorities worked during the Soviet period. Things really got interesting during the Brezhnev era, during which the USSR's need for hard currency, coupled with the rise of inflation in the West, led to large-scale exports of Soviet-made vehicles. In early-70s Britain, car buyers could pick up a brand-new Moskvich 412 sedan for £717, which was £22 cheaper than a Mini and only £3 less than the wretched Hillman Imp. Many did, though some scary crash-test results took a big bite out of UK Moskvich sales. And, as Teargas has proven with his LeMons car, plenty of Ladas made it to Canada a few years later. Thompson pays attention to Soviet racing achievements, from the early rally days to late-Soviet Lada hoonage. The machines of UAZ, IZH, RAF, etc., are here as well, with the story continuing to the end of the Soviet Union and a little beyond. This one earns a five-rod rating (five being the highest rating, in honor of the most reliable automobile engine ever made), plus Bonus Balalaika for sheer Hero Of The Soviet Union-grade awesomeness. Murilee says check it out!